You are here: Home / News / MSM and Left Racism on Parade in Ferguson. MSM and Left Racism on Parade in Ferguson. (ThyBlackMan.com) Talk about deja vu Trayvon Martin spin all over again, I could hardly believe my eyes. During a discussion on CNN about the shooting of Michael Brown by a white police officer, in the background was a photo of Brown in a school graduation cap and gown. Give me a break! Where was the picture from the surveillance video of the 6’4”, 290 pound thuggish Brown grabbing the store clerk by the throat after stealing cigars? The DOJ has advised news outlets not to broadcast the video of Brown assaulting the store clerk and robbing the store, claiming that it might insight violence. Okay, so allow me to make sure I understand the DOJ’s logic. Rather than exposing the true character of Brown, promoting the lie that a white police officer shot a studious innocent black youth who was simply minding his own business will not spark violence. Absurd. I tip my hat to black conservative, Kevin Jackson who hung tough during a slightly contentious CNN interview. Kevin refused to allow the CNN host to get away with portraying Brown as a “choir boy”. Way to go Kevin! By the way, liberals on the internet have called Kevin a fool. What I find most disheartening about the MSM’s and Leftist talking head’s coverage of the shooting is that it is all rooted in lies, political correctness and a racist low expectation of black Americans. The term, “institutional police brutality” is being tossed around. Hogwash! 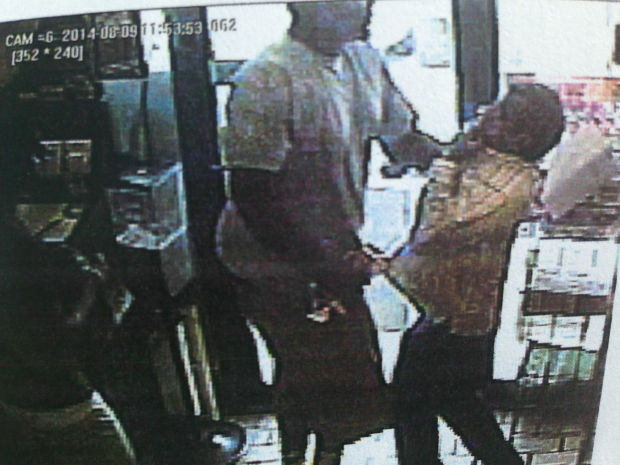 The fact that Michael Brown knew he could walk into a convenience store, take whatever he wanted and assault the store clerk without consequence says that Ferguson thugs have no fear of the police. The elephant in the room is the MSM’s racist bigotry of low expectations. The MSM have been disproportionately critical of Ferguson police while expressing little rebuke of the thugs and looters. It has been complicit with the DOJ in hiding the character of Michael Brown. As a black American whom liberals have called a stupid N word on numerous occasions for touting my conservative views, I get the feeling the MSM’s unspoken opinion is as followed. N****** have a right to act like n******. America should understand and compassionately tolerant it. This is pure racism and bigotry of low expectations. Stemming from our legacy of marching with Dr King, we are a conservative, upright and moral people. A majority of black Americans, if given the truth without PC and political spin will come out on the side of justice and the law. The MSM and the Left’s condescension is demeaning and insulting to black America. Would your opinion be the same if it were your kid shot twice in the head, back, front, stretched out in the middle of the street of the neighborhood he lived in. By the way, did anyone see an ambulance arrive? How did they take his body away.? of a DOG has more value then a BLACK MALE to them. stop eating chicken and sitting at the table to talk ? What are we talking about? How to trust the police again? Are you real.? for police offiers and make sure that they represent all races equally!!! Before you can eat that second chicken leg, they would have SHOT, KILLED, MURDERED another Black Man. Probably around Christmas. Don’t be fooled …they hate your Black face.! and want to get rid of you. They enjoy exercising their MANHOOD, a gun. White folks walk around with loaded guns in their pockets. They rarely get caught…No stop and frisk. He white, so he right. And what have you to say about the nasty stink, fat pig who grab a black woman from behind, pulled her to the GROUND and beat her with HIS FISTS! ? WHERE ARE THE REAL BLACK MEN. ?? STAND THE HELL UP OR SHUT UP!!! It was recently aired that the store owner admits that Brown was not the one who robbed him. Where were the cigars that he allegedly stole? Propaganda and the perpetual attempt to assassinate the Black man’s/woman’s character. This person has commented here before an always tkes the side of whites. He’s just another Uncle Tom who conservatives love to pay to say what they don’t feel comfortable in doing. He is embarrassing and really believes conservatives like him. I chuckled because they hate him as much as the rest of us and he wants their approval, acceptance, and to be viewed as a good “Black boy.” Pathetic and typical of those among Blacks who hold a very narrow concept of the kinship bond but more importantly where they fit in society. He has unfortunately opted to practice the perceived dominant culture’s (the ruling elite), political and social standards and mores. One’s perpetual engagement in the internal struggle. Nauseating better referred to as self loathing or hatred. This author’s writings are as usual, are thoughtless, cruel and transparent. Articles like that are part of what’s wrong with the world. The author does’t really believe what he is writing. On the bright side, he will grow up one day, and stop being a jerk in time. We forget so quickly from where we came and the tactics employed by a majority population weary of what they perceived as offensive behavior by blacks. When black men are killed and those killings are sanctioned by the institutions of the State, such as police forces, and the courts of this country, we should become concerned. Here is why; Read this article about sanctioned killings of blacks by the State in the recent past. “Lynchings [in the South] became a means of social control used to keep black people in a disadvantaged position,” says sociologist E. M. Beck. I agree with most of your article with the exception of MLK. I’ve posted comments about that. Anywho, there are also pics of this hoodlum online (Facebook, I believe) flashing gang signs back when he was a younger teen. Like I posted in another article, Michael was a proud member of the Vice Lords. Damn shame how black people cause all of this hostility, despair, and destruction for these out of control blacks, then complain how the same (type of) hoodlums make their neighborhoods unsafe. And will claim the police do nothing about it. I wonder why. The hundreds of protestors/rioters you see in Ferguson are the ones who condone the behavior of those like Michael. To these people, it’s normal for black males to assault and rob others. I read an article about the KKK coming to Ferguson to protect white people from looters/rioters/protestors. I don’t know how true it is, but I wonder how blacks will feel about that if it happens. …Exactly. And Holder swoops in with forty federal agents to set things straight.